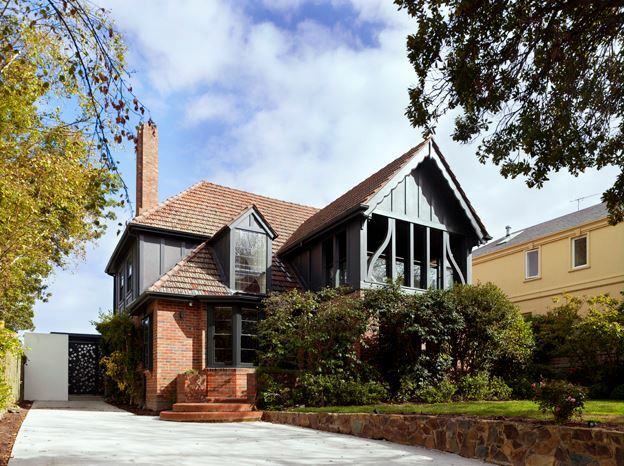 Kennedy Nolan Architects were asked to renovate this 1920s Tudor Revival style house in Hawthorn Victoria. It was not heritage listed but the architect quickly dismissed the suggestion of demolishing it. Every part of the house was reworked and a new pavilion was added to the rear. 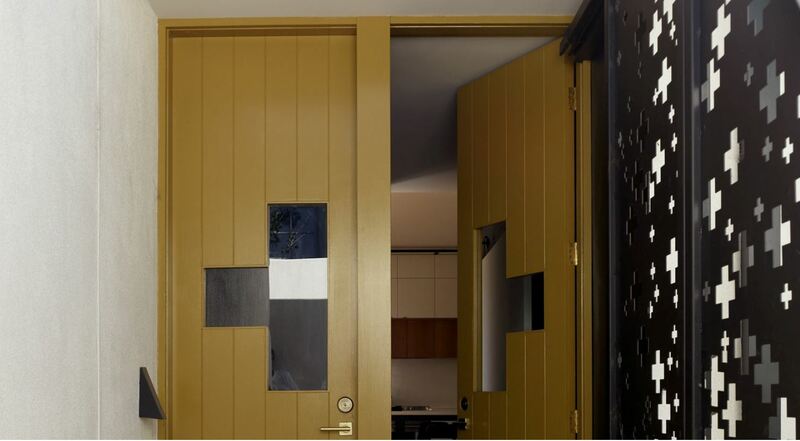 The renovation, undertaken in 2008, captures the spirit of this unique style, but at the same time cleverly applies a modern and whimsical approach to many of its original design features. Tudor Revival refers to the 20th Century revival of a style that was distinctly British, reflecting English and Scottish architecture of the 16th century and the nostalgic times of Merrie England and Henry VIII. Its continued popularity in Australia reflected its strong tie with Mother England. Sometimes known as Elizabethan or Old English. Tudor featured irregular facades, use of medieval motifs, tall chimneys, plain or cantilevered gables and sometimes battlemented parapets or towers. “The Arts and Crafts movement fascinates us because of the complexities contained in it’s incipient Modernism parallel to a pre-occupation with the crafts of making. During the twentieth century, the next time that Modernism became preoccupied with craft and making was Brutalism – also a movement of ongoing interest to this practice. There are a number of references to the Tudor period throughout the house. Lead lighting is used extensively throughout. 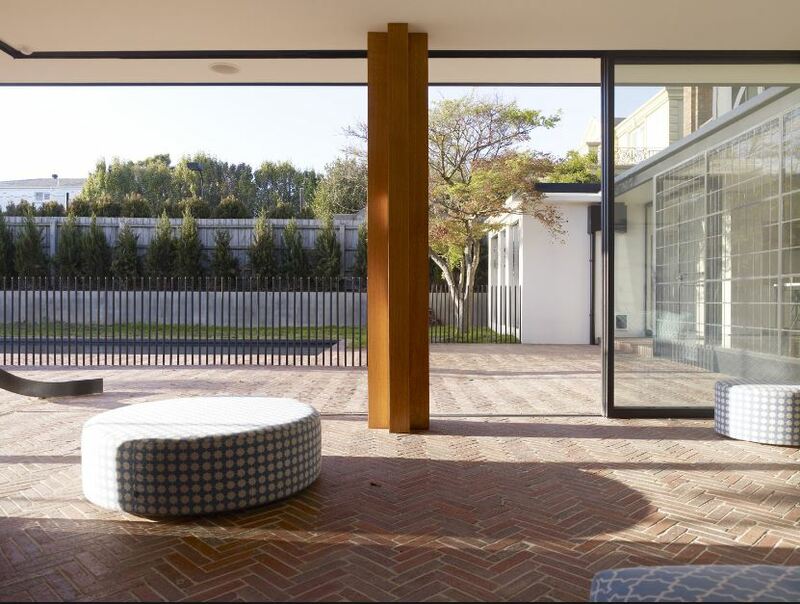 Herringbone paving in the rear pavilion and courtyard is a feature also reminiscent of the era. Iron work is used in the windows, on the ladder rail in the kitchen, the exposed sliding track over the dining room doors, in the legs of the kitchen bench and coffee table in the front room, in the pool fence. An important design feature is the massive structural “paperclip”, which dominates the rear courtyard. The recurring use of a cross motif throughout the house is also an important reference to the house’s heritage. Wooden cruciform columns are used as supporting beams, the screen on the pool fence is cross patterned, the metal front gates feature cross-shaped stencil cut-outs, an external door facing the kitchen has a glassed cross at eye level and the rear gate is perforated with a constellation of crosses. 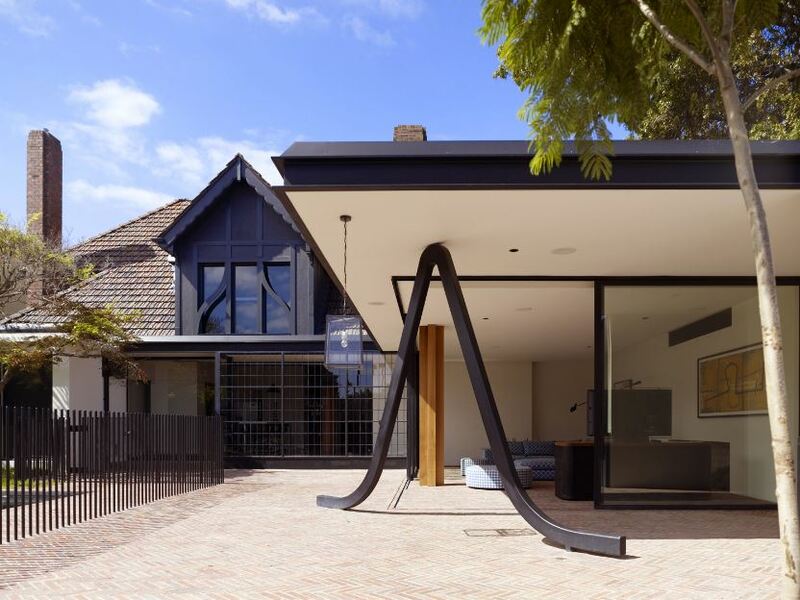 Behind its traditional façade is a very modern house. The architect has successfully introduced strong references, at times playful references, to its heritage without detracting from the original story.